​THE following proceedings are submitted to the public, for the purpose of removing the unfounded imputations to which Lieutenant Bender's character has been so long exposed. Many of his countrymen may have heard of the Charges exhibited against him, without ever having been made acquainted with the grounds of his acquittal. The history of his case will be found in the following memorial, presented by him to his Excellency Sir George Prevost, for the purpose of obtaining a trial. To His Excellency Lieutenant General Sir George Prevost, Governour in Chief, Commander of the Forces, &c. &c. &c.
The Memorial of Benoit Bender, Lieutenant in His Majesty's Forty-First Regiment of Foot. YOUR Memorialist is sorry to find himself under the necessity of troubling your Excellency with the present application: The hardship of his case will, he humbly presumes, operate as a sufficient excuse for intruding himself on your Excellency's notice. He begs leave to be permitted to lay before your Excellency a simple statement of facts which he will endeavour to make as succinct as possible. Upper Country, and has shared in almost every engagement with the enemy. It is not enough for your Memorialist to state, that before the existence of the grievances herein after complained of, his character as a soldier , had ever been free even from the breath of suspicion: He flatters himself that he can shew, whenever the long wished for opportunity shall be afforded him, that he had always enjoyed the confidence and esteem of his superiours and brother officers. said department, it is fortunate for your Memorialist that his conduct came directly under the eye of the Major General, and he rests with conscious security upon the Major General's knowledge of his character. That character was, however, again assailed by the reports above alluded to; this time they reached the Major General, through other channels, and he ordered the senior officer of the 41st Regiment, to obtain in writing from the said Captain Mockler, a statement of what he, Captain Mockler, knew or heard concerning you Memorialist, but the said reports were a second time as positively disavowed by Captain Mockler, as they had been by him in the first instance, and he made your Memorialist an apology for the same, in presence of Assistant Surgeon Falkener, then of the 41st Regiment. ing. The said Captain Chambers and your Memorialist, were together at the affair which took place on that day at the Miami River. A dispute occurred there between a relation of your Memorialist and Captain Chambers, with the particulars of which your Memorialist will not trouble your excellency; but it is very easy for him to trace to this source the enmity of the latter. After the engagement at Sandusky, in August 1813, at which your Memorialist was present, as was also Captain Chambers, your Memorialist again found himself quartered with Captain Chambers at Amherstburg, and continued there for the space of six weeks, doing duty and associating with Captain Chambers and his brother officers. Your Memorialist begs leave to mention, that Captain Mockler and Lieutenant Hayles of the 41st Regiment, were there also during the said period, a good understanding appeared to exist between Captain Chambers and your Memorialist; but he has since learned from high authority, that Captain Chambers had then secretly accused him of one of the highest crimes of which an officer could be guilty, and refused at the same time, to prefer any charges against him. 11th May, 1816[i], at York, where, the 41st Regiment then was, under the command of Major Friend; your Memorialist and Captain Chambers dined together on that day at the Mess of the Regiment. After Memorialist had withdrawn, Captain Chambers traduced his character, by a repetition of the former accusations, and that evening Major Friend signified to Memorialist that, in consequence of the statement brought against him by Captain Chambers, he would be no longer allowed to meet his brother officers at the same table. In vain did your Memorialist expostulate; he solicited in vain an opportunity to vindicate his character; he was condemned unheard. From that moment, he has remained an outcast from his Regiment; virtually and in effect suspended from duty, though never placed under an arrest; considered a burthen to his corps, and by those who knew not his innocence, a disgrace to his profession. "Shortly after I arrived at Amherstburg, in March, 1813, I was told that Captain Mockler, of the Royal Newfoundland Regiment, had [remainder of footnote on page 10] asserted, that he found Lieutenant Bender, 41st Regiment, hid behind a dead horse, in the action fought between our troops and the Americans at the River Raisin, 21st January, 1813. "I called upon Captain Tallon, commanding the detachment at Amherstburg, and mentioned the circumstance to him; he informed me he had also heard it and had reported it to Brigadier General Proctor, but that no notice had been taken of it. "On the 2d August at the unsuccessful attempt to storm Sandusky, I was sent by Lieutenant Colonel Warburton to bring up some men (of the right wing) from the rear. On my return, I saw Lieutenant Bender, lying under a log alone! I obliged him to accompany me to where Lieutenant Colonel Warburton was. After our return to Amherstburg, I officially reported the above circumstance to Major General Proctor." This statement is two fold; one part of it entirely rests upon the hearsay, not of the person who saw, but of a third person; the other is stated to be within the personal knowledge of the accuser. The first part is a mere echo of the reports which had been already disposed of, and of which your Memorialist humbly conceives himself entitled to plead an entire acquittal; the second has only afforded him uneasiness, because he has laboured under it so long. was. As soon as a late event* had assembled at Montreal, all the Officers who were well acquainted with his conduct, and amongst others his accuser, he again renewed his intreaties, and regrets to say, that he renewed them without effect. attacked as he had been, in that which is most dear to a soldier, his honour, he naturally looked for justice from his Commanding Officer, he was incessant, but always respectful in his applications. He may, perhaps, have solicited with importunity; but, he solicited with the feelings of an injured man, who only sought an opportunity of vindicating his character. At times he has had verbal assurances that an investigation must take place; at others, no answer whatever has been made, no attention paid to his communications. Your Memorialist takes the liberty of transmitting to your Excellency the letters which he thought it his duty to write, and the answers which he has been able to obtain. * The event here alluded to, is the assembling of a Court Martial for the trial of Major General Proctor. the 6th instant, in a letter which he had the honour of receiving from Major General Baynes, that "the evidence of Captain Mockler and Lieutenant Hayles of the 41st Regiment, was indispensably necessary for the investigation of his conduct, and that his trial must be unavoidably postponed until one of those officers could be called on." It would appear from this letter that the alledged necessity of the evidence of those witnesses, rests upon the statement of Captain Chambers. Such is the situation to which your Memorialist is reduced. He has now lived in disgrace (if to live in disgrace can be called existence) ever since the month of May last, the period at which he was shut out from the fellowship of his brother officers, and at which he received a copy of what Captain Chambers said against him, a statement of the most serious and aggravating nature. From the bare inspection of the statement, your Excellency will readily perceive, that the testimony of the two officers mentioned in the letter from Major General Baynes, if of any weight at all, can only go to the reports, said in the statement to proceed, not directly from Captain Mockler, but from third persons, as having come to them from Captain Mockler. portunity of establishing his innocence. He has a fair opportunity of doing so now, should your Excellency be pleased to order his trial to take place. But the same reasons, no doubt, still exist for inducing Captain Chambers to defer an investigation. All the witnesses necessary for the defence of your Memorialist happen at present to be collected at Montreal; it is an opportunity which may never occur again; their respective duties will at the opening of the campaign, place them far asunder, and by the chances of war, he may be deprived of their evidence forever, or remain exposed, it is impossible to say how long, to the ignominy of an endless accusation. If his character were still to continue loaded with obloquy, as long as it has hitherto, he may be called upon by his accuser, at a moment, when he has not a witness left. In an early stage of this accusation, when the above mentioned Assistant Surgeon Falkener was about to proceed to England, your Memorialist notified Major Friend, that he was a necessary witness; but, Assistant Surgeon Falkener was allowed to depart and your Memorialist will never now be able to avail himself of his testimony. with respect to the first part of it upon which Captain Chambers would contend that the absence of the two witnesses ought to be a bar to an immediate trial, Major General Proctor's communication with Captain Mockler, was official and direct, that statement was declared unfounded by Captain Mockler, and in that respect alone, the Major General's statement, would, your Memorialist humbly conceives, be sufficient to outweigh that of Captain Chambers, inasmuch as by his own assertion, his information was not derived from Captain Mockler, but from third persons. Your Memorialist would be apprehensive of having trespassed on the attention of your Excellency, if his object were not to attain from your Excellency that justice which he can expect from you alone; he has therefore thought it necessary to put your Excellency in possession of the whole of his case, fully confident that the justice of your Excellency will render all further reference of it unnecessary, and that your Excellency will be pleased to order that the trial of your Memorialist do take place forthwith. And your Memorialist, as in duty bound, will ever pray, &c.&c.&c. In consequence of the above Memorial His Excellency was pleased to order that Captain Mockler, then at Michilimakinack, and Lieutenant Hayles, then at New Brunswick, should repair to Quebec for the trial of Lieutenant bender. They both arrived in June following. A petition was then presented to His Excellency Sir G. Drummond the administrator in chief - and thereupon a Court Martial was ordered to be convened at Quebec on the 17th July following. MEMBERS OF THE COURT MARTIAL. Assembled and Sworn 17th July, 1815. MAJOR GENERAL GLASGOW, Royal Artillery. Lieut. Colonel M’Pherson, 10th Veteran Battalion. Lieut. Colonel Moody, 104th Regiment. Lieut. Colonel Smelt, 103d Regiment. Major Courtney, Nova Scotia Regiment. Captain Griffith, ) 103d Regiment. I. “For misbehaving before the enemy in action on or about the 22d January, 1813, at or near the River Raisin in the Michigan Territory in the United States of America, by concealing himself while the detachment of His Majesty’s Troops with which he was serving, was engaged with the enemy. TESTIMONY PRODUCED ON THE PART OF THE PROSECUTION. or to get ammunition for the guns - I do not recollect which. I saw no more of him until I saw him at the left of the village. Q. At the time you saw Mr. Bender lying behind the sled was he in the rear of his men and how far was he from them? A. The men had just retreated before I saw him. Before they retired they had been immediately on his right and had fallen back to the ravine, which was the reason for going there. At this time the detachment I commanded had driven the Americans and was up under a barn. While the Americans were firing, Mr. Bender was thirty or forty yards from the men who had fallen back. The men were immediately ordered to go to the left, along the ravine, to the right of the village. Q. Did Lieutenant Bender give you any reason for being in the situation you have described? A. No - I asked him the reason. He only said he had not been there long, as I have before stated. Q. How long had the troops been in action at the time you saw Lieutenant Bender behind the sled of ammunition? A. About two hours, to the best of my recollection: The action began at day-light. A. Not that I recollect. Q. If any person had been there at the time, should you have seen him ? A. I think it likely I should - I did not stop long. If any person was there, he must have been very close behind the sled. I saw several wounded lying in the field, but not near him. Q. Did it appear to you that the sled was of such a description, as to afford any protection from the fire of the enemy ? A. Yes - I think it would, from the position it was in, for the horse's head was towards the enemy and the field magazine was on the sled. Q. What was the height of the sled and magazine? A. The sled was a common one, of the height of the common Canadian sleds which are used in winter. The magazine, in the manner in which it was placed on the sled, was about three feet high, from the ground. Q. Was there not a ravine in the rear of the sled; and at what distance from it? A. Yes, about thirty or forty yards. This was the ravine into which the men had fallen back. Q. Were there any men under cover of the ravine at the time? A. The men had fallen back to the ravine when I went there. There were very few men in the ravine. retreat to the ravine, and put themselves under cover. A. I heard no such orders and have no knowledge of such having been given. Bender occupied during the action, and if you do, at what distance from that position was it, that you saw the sled ? A. I do not know what position Lieutenant Bender occupied, as I was looking to my own men, who were on the left. Q. Did you, on your return to the line, or at any other time, and when, report to General Proctor, the situation which you saw Lieutenant Bender? Q. How long afterwards was it that you saw Lieutenant Bender on the left of the line ? A. I suppose about half an hour. Q. Had he any ammunition with him when you saw him the second time and did you see him deliver any to the troops ? A. I did not see any with him. on the left, concealed behind barns and houses, after the movement from the right? A. Yes, I believe it was for that purpose they went there. Q. Did you ever mention to any other officers, and to whom, the circumstance of seeing Lieutenant Bender behind the sled, and what were the terms you made use of? A. I mentioned it to Doctor Faulkener, Lieutenant Hales and Captain Houghton, at Amherstburg. I believe I mentioned it before all the officers who were at Amherstburg, who had asked me about it, whether it was true. Q. On what occasion was it, that you mentioned it to the above officers? A. I mentioned it in my own room, two or three evenings after the engagement. Q. What gave rise to your mentioning it? A. They were talking about the detachment of the 41st and Newfoundland. Q. Did you say at the time, that you saw Lieutenant Bender lying behind a dead, or a wounded horse? A. I do not recollect whether I said a dead, or a wounded horse - I think I said, a wounded horse. The​ officers said after, it was a dead horse - I told them they were mistaken, that it was a wounded horse. Q. What officer did you hear say, it was a dead horse? A. It was said by several of them and I think by Mr. Hales and Captain Tallon. It was generally spoken of as a dead horse. Q. Was it not in consequence of a degree of rivalship between the two corps, that you mentioned the circumstance alluded to? A. It was in consequence of the officers saying that our men behaved much better than theirs. Q. Did you perceive any alteration in the conduct of the other officers to Lieutenant Bender from what you had mentioned to them? A. Not that I heard of, but it was spoken of as a shameful thing. Q. Did you not, yourself, treat him with the same friendship as before? A. I spoke to him as I would to any other officer, not having any particular friendship for him. Q. Did not the command of the garrison devolve upon you shortly after, and did you not appoint Lieutenant Bender Fort Adjutant, in preference to several others? upon me, while Colonel St. George was wounded. Captain Tallon was there also and was wounded. I always called upon them and took directions from them. Q. At the time you saw Lieutenant Bender on the ground behind the ammunition magazine, what impression had you as to his situation? A. I thought it an extremely awkward situation, to se him in at the time. Q. What did Lieutenant Bender do in consequence- of your telling him to get from behind the magazine? A. He got up and went a direct line to the ravine- vine; I went across to the right of the 41st. Q. Was there any officer of the 41st near you during the time you saw Lieutenant Bender in that situation, to whom you communicated it? A. Not at the time. Q. Did you make any objections to Lieutenant Bender’s being appointed Fort Adjutant, at the time he was proposed? A. No - I believe there was no one else to act, at the time. Q. Was not Lieutenant hales, of the 41st, and Lieutenant Garden, of your own corps, at Amherstburg? A. I do not recollect. Q. Were you in the action on the 22d January, at the River Raisin? Q. Did you see the prisoner in the action, and in what situation? A. I did not see him in the action, but I saw him during the action. Q. Were you wounded in the action, and did you in consequence go to the rear? A. I was, and did go to the rear. Q. Did you see Lieutenant Bender on your going to the rear? A. Immediately on my leaving the surgeon, I saw Lieutenant Bender amidst the wounded men. Q. What time was this? A. In the morning the action commenced at Reveille; and it might be about an hour and a half from the time the action began first - It was after the troops were ordered to charge. Q. Did the enemy capitulate: if so, was it before, or after the surrender, that you say Lieutenant Bender among the wounded? A. The action was going on very brisk at the time I saw him. Q. What passed between you and Lieutenant Bender at the time you saw him? A. I asked him, immediately, whether he was wounded, as I supposed nothing else would have brought him there. He replied, he was not wounded. I asked him what business he had then. He said, Colonel Proctor had sent him to bring up some men. I told him, that if he looked round, he would not see any one there who was not bleeding or disabled. He immediately went away. Q. How far was it from the troops engaged, that you saw Lieutenant Bender? A. I cannot tell the distance, it was out of range of the fire, where the Doctor was dressing the men. Q. Was there a ravine near the place where the troops were engaged, and if so, had they retreated to it, at the time you saw Lieutenant Bender? A. They had retreated into the ravine previous to the time I saw Lieutenant Bender. Q. Did you see any stragglers near the place where the wounded were? A. No - I did not see a man - there were a great many wounded - nearly one half we brought into the field. Q. Had the troops retreated to the ravine previous to your leaving them in consequence of your wound? Q. Were the wounded, where the surgeon was, in the rear of the ravine, or to the right or left of it? A. In the rear, a great way and out of the field. Q. How long after the commencement of the action was it that you left the field? A. I cannot state the time - but it was some time after the men had retreated to the ravine? Q. How long after the commencement of the action was it, that the men retreated to the ravine? A. From the time the first gun was fired, it might have been about an hour, or an hour and a half. Q. At the time Lieutenant Bender mentioned to you that he had orders to collect the men in the rear, did he not tell you that he had also orders to procure ammunition? Q. When you saw Lieutenant Bender in the rear, were you not in a cariole, or getting into one, for the purpose of retiring to your quarters? A. There was a cariole, I believe belonging to Doctor Faulkener, and I was going over to sit down in it. went to the rear, and how long did you remain there after he arrived there? A. I did not see Lieutenant Bender until he was among the wounded men, and I remained some time there, after, sitting in a cariole - It was less than one half hour. Q. Had the prisoner been in the action on the 22d of January, must you not have seen him? A. I am sure he was in the action , on the left of the wing I commanded. He commanded one of the divisions. Q. Where was the division that Lieutenant Bender had the command of, at the time you saw him among the wounded? A. Those who were not wounded were in the ravine when I left the field. Q. Were there any ammunition waggons as far back as where the wounded men were? Q. Are you aware that Lieutenant Bender had any other duty on that day, except the command of the division? A. I know nothing about it. When he came to the rear he told me it was to collect men; and two days after, he told me he was sent for ammunition. Q. Did you notice that Lieutenant Bender was absent from his division, at any time before he went to the rear and if so, did you observe any thing remiss in his conduct? A. I did not see him at all in the action. Warburton. I brought him to Colonel Warburton, and when we came up, I told Colonel Warburton what I had seen. Q. Did Lieutenant Bender belong to the wing which you accompanied? A. He commanded a division of it. Q. Were there any men near him, at the time you saw him behind the log? Q. did he account, in any manner, for his being found in the situation you have described? A. No, he said nothing. Q. How far was he from the ravine, when you saw him? A. Upwards of two hundred yards, not directly to the rear, but inclining to the rear - to the left. Q. What was the strength of the wing under Colonel Warburton? A. Perhaps one hundred and fifty, or one hundred and sixty men. Q. Do you know whether the men of the division which Lieutenant Bender commanded, came up the ravine? A. I believe not, I did not know the men of the division. The division I went with, came up. Q. Had the attack commenced, when you saw Lieutenant Bender in the situation you have mentioned? A. We had advanced to the ravine under a very heavy fire of small arms. We lost several men in the advance and several in the ravine. Q. When you proposed going to the rear, to collect the men, were not Colonel Warburton and the other officers, concealed in places of safety, behind the bank? A. We had advanced to within thirty paces of the work, when Colonel Warburton had ordered the men to halt and cover themselves until the rear should come up and join us, to attack the work. Q. Did Colonel Warburton and the officers and men then present, cover themselves accordingly? A. They layed down - there was no cover, but by lying down under the slope of the bank. Q. Was not the bank sufficiently elevated to protect, from the fire of the enemy, those who were lying down? A. There were two men killed, at the time they were lying down? Q. Were they killed lying down, or looking over the bank? A. They were killed when lying down. to go back, was there any person present, who heard you propose, and who? A. Captain Dixon was at hand - I do not know whether he heard me - I spoke in my usual tone of voice. Captain Bullock and all the other men who were in the ravine, were there. Q. How many subdivisions were there under Colonel Warburton? Q. Do you know who were the platoon officers, with the right wing? A. Captain, then Lieutenant Bullock, Lieutenant Bender, Ensign Proctor and I believe Lieutenant Gardner - I think he was one of them. Q. How many subdivisions reached the right of the Fort with Colonel Warburton? A. I believe the whole of the first subdivision came up, and perhaps the whole of the others, but I cannot tell exactly. Q. Did not the whole of the right wing march from the left of the Fort, and did you not accompany it, on the right, through the woods? A. I suppose the whole of the right wing did march from the left of the Fort - I cannot say certainly whether it did or not - I was in my proper place, at the head of the wing, as acting Deputy Assistant Quarter Master General. the right, did not the second subdivision scatter in the bush? Q. When you came back, were not all the officers and men lying down? A. They were lying down in the same situation in which I left them. Q. When you first saw Lieutenant Bender, did you say anything to him before making use of the expressions alluded to, or did you immediately accost him, by saying, if you had a leg to kick him with, you would do it? A. I asked him what he was doing there, and told him to get up. Q. Why was it more criminal in your eye for Lieutenant Bender to be behind a log, than it was for the other officers to be concealed behind the bank? A. Lieutenant Bender was not within two hundred yards of the division - We were within thirty yards of the Fort and were ordered to cover ourselves, by Colonel Warburton. A. I had no occasion to shelter myself there, for it was out of all danger. Q. When you went back to collect the men, did you go in front of the ravine, or in its rear, or through the ravine itself? A. I have already said that I went to the rear, part of the way through the ravine - It was out of the question going in front of the ravine. Q. How far through the ravine did you go? A. But a short distance - how much, I cannot say - the principal part of the ravine runs off from the garrison, and I was under the guns of it. I went some distance through that part which turned off by the left. Q. Did you go fifty yards through the ravine? A. A short distance - I cannot state how far. * This question may appear, at first view, to amount in some measure to an admission of the fact, as stated by Captain Chambers. But, the reader will be good enough to observe, that in cross-examining a witness, it is sometimes expedient to assume as true, that which he has [on page 34 in original transcript] stated in his examination in chief, in order to exhibit him in contradiction with himself. Thus, Captain Chambers says in his answer, that he had no occassion to shelter himself there, “for it was out of all danger.” But, if according to his own statement, there was no danger to be apprehended there, what motive could have induced Lieutenant bender to place himself in such a situation? The act imputed to him by this witness, could only have been produced by a fear of danger, and how could there have been a fear of danger in a place out of all danger? So much for the consistency of the witness. The fallacy of the accusation must be apparent from the evidence of Serjeant Dukes, Serjeant Stagnell, colour Serjeant White, Ensign Proctor and Lieutenant Fitzgerald, produced by Lieutenant Bender on his defence. The fact is, that when the order mentioned in the preceding answer was given, Lieutenant Bender was in the place pointed out by Serjeant Dukes, whose testimony is corroborated by the other witnesses above mentioned, and there it was that he must have been seen, for the first time, by Captain Chambers. Q. Describe, as correctly as you can, the situation of the place where you found Lieutenant Bender, whether it was in the ravine, or in the rear of it - If so, how far in the rear of it? A. I have already said, that I found Lieutenant Bender about two hundred yards in the rear, to the left, hid under a log. Q. Did you and Lieutenant Bender remain with Colonel Warburton after you had made your report to the latter, and how long? A. I remained with Colonel Warburton until nearly dark, to afford us an opportunity of getting away. Lieutenant Bender went away before I did - I do not recollect how long we were both there together. Q. Did not Lieutenant Bender, sometime after you arrived, volunteer his services to collect the stragglers in the rear, and did he not thereby expose himself to the fire of the enemy? Relate what you know of that circumstance? A. I know nothing about his volunteering - I have already stated that he went to the rear. Q. Was he, in going away, exposed to the fire of the enemy? A. Yes, he was, but took great care to screen himself, by jumping from log to log with a great deal of dexterity and agility, and creeping on his belly. Q. Did you not hear Lieutenant Bender say, that Colonel Proctor wished to see you and Colonel Warburton? A. Lieutenant Bender never spoke to me afterwards. I never heard him say so. Q. Did Lieutenant M’Lean, Aid-de-Camp to General Proctor, come to the place where you were, after the departure of Lieutenant Bender? A. He did not. I think I heard his voice through the bush, calling to me to bring the men off, by order of Colonel Proctor. Q. What was your answer? A. I believe my answer was, that he might come and bring them away himself, for it was quite impossible to bring the men through the ravine, and that it was ridiculous to attempt it. Q. Who was present with Colonel Warburton when you told him you found Lieutenant Bender concealed under a log? A. The party that came up to the ravine were all lying about us; Captain Dixon and the same persons that I left there Q. Must not the persons present at the time, have heard you report the conduct of Lieutenant Bender? A. I do not know whether they did, I spoke in my usual tone of voice. Q. You said that Lieutenant Bender was two hundred yards in the rear of the ravine - Did you observe any other officers under cover between the ravine and the log? Q. When you brought up Lieutenant Bender from the log, did Colonel Warburton make any observations on your report? A. He said that Bender was a damn’d something or other. me against the nature of the accusation. If such is the state of my own feelings, what must not be the impression upon the minds of those, who are yet unacquainted with the grounds of my defence? But I feel that in addressing you, I have no prejudices to combat, and in this consoling reflection, do I find a great source of relief. Your opinion will not be formed until you hear my side of the question. You will, I am confident, lend an impartial and an indulgent ear to every thing which I shall have to urge in my justification. I do not, however, intend to trespass on your attention more than is necessary. My anxiety to bring under your view every material circumstance, shall not lead me too far. A succinct statement of facts, will, with the help of a few observations, put you sufficiently in possession of my case; and when I shall have established, by proof, that which I am about to lay before you, I shall feel perfectly secure in trusting my long injured honour to your hands. In speaking of such charges as these exhibited against me, which go to strip me of every claim to the character of a soldier, and which puts at issue every thing that is sacred to an officer; I feel it incumbent on me, to give an account of the whole of my conduct, and to state the facts, which, on any other occasion, I should not be justified in mentioning. early in the morning of the 22d of January, 1813. Two divisions, composed of about ninety men, were sent to the right; the one commanded by Captain Tallon, the other by myself. The remainder of the troops were stationed on the left; the whole under the command of Major General, then Colonel Proctor. The enemy were sheltered behind a paling of about four or five feet high; they advanced within a short distance of the paling, and finding it impossible to bring up the men to the charge, a brisk fire commenced on both sides; it was wholly unavailing on our part. Within about an hour after the beginning of the action, Captain Tallon, commanding the right, was wounded and retired to the rear. His recollection as to the time of receiving his wound does not happen to agree with mine, nor with that of others engaged on the same ground. After Captain Tallon had left the field, I found myself the only platoon officer on the right. I felt that a double duty had then devolved upon me: I shall leave it to others to state particularly the manner in which I discharged it. Let it suffice for me to say, that I redoubled my efforts to to[sic] encourage the men, as well by exhortation as by example. me; it could not have escaped the attention of the men who were fighting by my side, the attention of the wounded, who were lying on the ground immediately in my rear; least of all could it have escaped the attention of the Colonel, commanding, who never left the field, who came frequently to the right and spoke himself to the men under my command. They will appear before you: To their testimony do I trust for a correct account of my conduct, while the troops were engaged with the enemy on the right. Nor will the latter part of my conduct on that day, now so disfigured by the testimony before you, be found, when explained, less satisfactory than the former. I have presumed to trouble the court with the above observations, because, from the evidence on the part of the prosecution, they must have conceived that I had no share whatsoever in the action. the ravine, in order to renew the attack; we were ordered accordingly to take ground in that direction. While moving thus to the left, Lieutenant M’Lean, acting Aid-de-Camp to Colonel Proctor, directed me to go to the rear where the wounded were, to collect as many as I could, and bring up, at the same time, some ammunition. Our reduced numbers required increase, and from the continued firing, the men had nearly emptied their pouches. I obeyed immediately, and notwithstanding Captain Tallon’s humane observation, with respect to the “bleeding and the disabled,” I collected some men - I cannot now say how many - I believe seven or eight, and sent them on to the left. I found also in the rear, a sled with a horse and an ammunition waggon, in charge of private John Nettles, then soldier in the 41st Regiment, now one of the settlers at William-Henry. It became a hazardous undertaking for me to bring up this sled. The field in the rear of the ravine was intersected with fences, that admitted of no passage for the sled - it was necesary[sic] to make one through each fence. Nothing was easier for me, than to have gone up myself, with the men I had collected in the rear; but my orders were to bring up ammunition, and I knew myself that the men were in want of it. I therefore from a sense of duty, proceeded with the above mentioned Nettles, to bring up the sled. From the many obstacles we had to encounter, it was with the utmost difficulty that we succeeded in coming up to the left. We never passed within more than fifty yards of the rear of the ravine; in approaching towards the left, we met Captain Mockler, much in the rear of the ravine - he passed us at the distance of at least twenty yards. - Such is the account of my journey to the rear. Fortunately for me, I have it in my power, to shew that the testimony of Captain Mockler is altogether unfounded. I will not, however, pretend to say, that Captain Mockler has stated intentionally a fact which is not true. I will not say, that he has stated, intentionally, circumstances which were never connected with the fact as described by me, but I must say, in my own defence, that the impression which Captain Mockler entertained of that fact, shortly after its occurrence, was very different from the impression which he entertains now. It happened so long ago as January, 1813. I should be sorry to hint that lie has borrowed the eye of Captain Chambers to assist him in taking a retrospect, but some unfriendly mist, must surely have interposed, which spreads in larger dimensions, to his view, all the disadvantageous part of an object so remote, while it obscures altogether those of a more favourable complexion. burg, that Captain Mockler allowed himself certain liberties with my character, I called upon him, accompanied by Doctor Faulkener of the 41st Regiment. The impression upon Captain Mockler’s mind, was very different then, from what it is now; at least he stated it so to be. He explained away the report that was in circulation. He said, that what he had mentioned, was in a moment of levity, adding, as stated in his testimony, that the whole had originated in a spirit of rivalship between the two corps - meaning the Newfoundland and the 41st. Here I have to express my sincere regret, that I have it not in my power to produce Doctor Faulkener before you. Captain Chambers having afterwards revived the above report, I made application to Major Friend, then my commanding officer, for the detention of Doctor Faulkener, who was immediately about to leave the Province; but my application was disregarded. Doctor Faulkener, however, previous to his departure, mentioned the whole of what had taken place, to Surgeon Moore, of the 41st Regiment, a witness summoned to attend this court on my behalf, and to whom I appeal for the correctness of my assertion. was I to have done? To have remained exposed to the shame of an interminable accusation, until the attendance of Doctor Faulkener could have been obtained, or to have come before a court of honour and of equity, not without a hope that superiour [sic] to legal quibble, it would take notice of what I now assert, and hear Surgeon Moore on the subject? ken place, and that his recollection must have been perfectly fresh at the time. But we have only to hear Captain Mockler himself, to be convinced that it is impossible that I could have been found in such a situation. He says, that the right wing had retreated into the ravine and were ordered to go to the left, along the ravine ; that his detachment, on the left, had driven the Americans and was up under a barn. What must have been my object in getting behind a sled? No doubt my object must have been to seek a place of safety; but if the troops were in the ravine, I certainly must have found shelter there. On reaching the left, I must have found a shelter behind the barn, with Captain Mockler’s own men; a shelter in both instances rendered necessary, from circumstances pointed out by the commanding officer, and resorted to by all the troops: A shelter consequently without disgrace, more secure by far than the protection that could be afforded by a sled, such as described - thirty or forty yards in front of the ravine, in a level open plain, exposed to view on all sides, and not seen either by any one on the left, or by any of the wounded in the field! The thing is utterly impossible. I shall prove by the most satisfactory evidence, that had any such objects been in the front of the ravine, they must inevitably have been seen. No such objects were ever seen there; the conclusion, therefore is, that no such objects ever were there. Captain Mockler did indeed see me, as I have mentioned, in the rear of the ravine - it might have been about thirty or forty yards: But if Captain Mockler’s attention was so much attracted by other objects, or so confused by haste, that he mistook thirty yards in the rear, for thirty yards in the front of the ravine, he might as well have mistaken a knap-sack for a magazine; a man standing up, for a man “lying with his face towards the ground;” a horse trotting, for a horse standing quite still; the words, I have plenty of ammunition, for the words, I have no ammunition at all. Captain Mockler’s mistake may be easily accounted for. The fact is, that he was running to the rear to collect his men, and who can ever expect correct information from a running witness? rivalship of corps,) to trifle with the character of an officer, and I am confident that we should have never heard of this first charge. (about nine o’clock in the evening,) therefore the troops were not engaged, after that order was given; now the concealment attempted to be proved under this charge, did not take place until Captain Chambers had travelled three hundred yard, after the order had been given. this court, could not even prevent him from manifesting, it is evident, that he already feasted his imagination upon the pleasure of finding me deficient in duty - he had resolved it should be so - he spoke with oracular ambiguity, but his meaning was pretty plain. Once become a prophet, he was determined to accomplish his own prediction himself, by conjuring up facts, that were never in existence, except in his own imagination, and upon the record of this trial. He did indeed watch me, as it would appear from his evidence; he watched me with the eye of a Lynx; he watched me so as to entirely forget himself; there is hardly a fact that he has advanced, which cannot admit of contradiction. I will not tire the court by establishing a parallel between what he has stated, and what he ought to have stated; suffice it to say, that the truth is only to be found in the converse of his testimony, a testimony so destitute of even the common ingenuity of invention, that it can admit of but one general remark. that of a General advertising for his lost army. ever, at length arrived; I have hailed with joy its approach, and I shall feel forever grateful to His Excellency Lieutenant General Sir Gordon Drummond, for having granted it to my earnest solicitations. I have not been able to meet it, it is true, with the same advantages that I could have done before; the chances of war and other circumstances, have deprived me of very material and necessary witnesses; but, I trust, that I have laid sufficient before you, to establish my innocence. EVIDENCE ON THE PART OF THE PRISONER. Q. Have you been in the 41st, and how long? A. Seven years and six months. Q. How long have you been a Serjeant in that Regiment? Q. How often have you been in action? A. Seven times - three times with Mr. Bender. Q. Were you in the action at River Raisin, on 22d January, 1813, on the right, or on the left wing, and in whose company? A. I was on the right, in the second grand division, covering Serjeant to Mr. Bender, in Captain Muir’s company. Q. Of what number of men was the right wing composed, when you went into action? A. I cannot say for the whole wing, but there were about twenty-four, or twenty-five files in our division. Q. Who were the officers on the right wing besides Lieutenant Bender? A. Captain Tallon, I saw no other. Q. What situation did the enemy occupy? A. They were behind some pickets, which were nearly as high as their chins. Q. Do you know if Captain Tallon was wounded, if so, how long after the action was he wounded? A. About half an hour, or three quarters of an hour after the action began - I did not see him, it was reported along the line, that he was wounded and had gone to the rear. Q. How long did the action last on the right? A. It lasted about two hours, I cannot say to within a few minutes. Q. Did you continue to be Lieutenant Bender’s covering Serjeant, during the action on the right, if so, state what you know of his conduct? A. He quit the line once to go in the front - a man’s firelock would not go off, and he went to help him to discharge it. I saw him come into his place again, along the line between both fires; his place was at the right of the grand division - he remained there during the action. We moved up by grand divisions three or four times and charged afterwards - Mr. Bender saying out, come on my lads, charge them my boys, we shall soon have the place. - The charge had no effect, we went back by signal into the ravine, and took ground to the left, to form on the enemy’s left flank; as we were passing along the field, Mr. M’Lean, Aid-de-Camp to General Proctor, came up and I heard him tell Mr. Bender to go and get ammunition from the rear; he went for ammunition, and we made the best of our way to the right of the enemy, to an old barn and some houses; we had not been long behind the houses, before I saw Mr. Bender coming along with ammunition and a sleigh with Nettles, a soldier of the 41st - I saw Mr. Bender push down a fence, to let the horse get the nearest way to the troops; he brought the ammunition up and it was served out to the men. did you see him coming in front, or in the rear of the ravine? A. I do not know whether the ravine lay along the field where we were, if it did, he crossed the ravine. Q. Could Lieutenant Bender have gone to the rear in a shorter space of time? A. No, nor any other man. Q. How often did you hear Lieutenant Bender encourage the men on the right? A. I heard him at different times, but I cannot say how many. Q. How near to the picketing, and how often did he lead the men up? A. To within twenty yards, or perhaps nearer. We charged only once - we had advanced in grand division before, but not so close as that. Q. When he led the men to the charge, were there any other officers on the right wing? A. No other officer; Captain Tallon was wounded before that. Q. Was, or was not, the conduct of Lieutenant Bender when on the right wing, that of a brave officer? A. I would not wish to go into action field, with a better officer. Q. Did the enemy keep up a heavy fire during the action on the right? Q. How many men of the right wing, were left in the field, when you took ground to the left? A. Between thirty or forty. Q. Did the ravine afford complete shelter from the fire of the enemy? A. Yes, if the men had laid down close. Q. Did Lieutenant Bender remain with the troops after he arrived from the rear with the sled? A. He remained until the enemy surrendered, and then he went to the rear to count the dead and the wounded. Q. Did the action continue after you had taken ground to the left? A. Every now and then, a shot was fired; the enemy was under cover and we also. Q. How far was Lieutenant Bender from the barn, when he was ordered to go for ammunition? A. Between fifty and one hundred yards from the barn, in the rear of which we went to form. Q. If there had been a horse and sled forty or fifty yards in front of the ravine, must you not have seen it? A. Yes I must have seen it. Q. Did you at the time see any horses dead in front of the ravine? A. I saw none, until I saw the horse and sled with Mr. Bender and Nettles. Q. Were you at the attack on Sandusky in August, 1813, in whose company and in what subdivision were you? A. I was covering Serjeant to Lieutenant Bender. Q. State what took place on that occasion? A. The troops having been formed between the left of the garrison and the river, the word right and left face was given; the right wing was ordered to march round double quick, to attack the right angle of the Fort. After having passed the left angle, we were discovered by the enemy, who opened a heavy fire upon us; the division in front of us, commanded by Mr. Gardner, gave way and fled to the edge of the bust; the division which Mr. Bender commanded, gave way also. Mr. Bender was between the men who gave way and the garrison, and was waving his sword and calling out to his men frequently, to go that way, pointing towards the garrison. I remained with him. I saw a man firing from the corner of the block house, I had occasion to fire at him once or twice, and Mr. Bender out ran me towards the right of the garrison. Mr. Bender was about twenty or thirty yards in front of me, towards the right angle of the garrison, when word came along from the right to the left, that every man should secure himself as well as he could. At that time I saw Mr. Gardner and saw no more of Mr. Bender. Q. Did you see Colonel Warburton at the time word was given for every man to secure himself? A. No, I did not see Colonel Warburton. Q. How far was Lieutenant Bender from the garrison, when the word came for every man to secure himself? A. No more than twenty yards. Q. Was Lieutenant Bender on the bank when you covered yourself? A. Yes, he was towards the garrison, between the ravine and the enemy. Q. Was there at the time a heavy fire from the garrison? Q. What efforts did you see Lieutenant Bender make to rally the men? A. I heard him say many times to the men, come this way men - he made every effort in his power to get the men towards the garrison. Q. How many subdivisions moved to the right of the Fort, and how many platoon officers were there? A. Four subdivisions; Lieutenant Bullock commanded the right subdivision, Lieutenant Gardner the second, Lieutenant Bender the third and Ensign Proctor the fourth. Q. Did the troops on the right come into action after they had secured themselves? Q. How many were with you, when you went into the ravine? A. Seven or eight of Mr. Bender’s subdivision, and some of the grenadiers. Q. Did Captain Chambers ever come to the place where you were secured, to look for men? Q. How long did you continue in the ravine? A. Almost an hour and a half. Q. Did not Lieutenant Bender use every possible speed to reach the right angle of the Fort? Q. Could he not have reached the right angle with the subdivision, had he not been delayed by encouraging the men? Q. Did any men go to the left in the rear of the ravine? Q. Have you at any time had any conversation with the prisoner, respecting the evidence you were to give at this Court Martial? brought by Lieutenant Bender, was issued on the 22d January? Q. How far from the enemy was the ravine, at Sandusky? A. One hundred and fifty or two hundred yards. Q. When Lieutenant Bender was encouraging the men, how far was Lieutenant Bender from the ravine? Q. Did you at any time see Lieutenant Bender lying under a log, before you got to the ravine? A. No, I saw no log at all. Q. How far was the ravine from the garrison? A. Not more than thirty yards from the right angle of the garrison, and about forty from the place where I laid down. Q. Did you see Captain Chambers in the ravine? Q. How many persons were in the ravine? A. I cannot say, they were scattered about. Q. How long have you been a Serjeant, and how long in the 41st? A. Seventeen years in the 41st, and about five years Serjeant. Q. Have you ever been in action and how often? Q. Were you in the action at River Raisin, on the 22d January, in what wing and in what company? A. Right wing and right division grenadiers. Q. How long did the action continue on the right? A. About two hours and a half before I was wounded, when our troops retreated immediately to the left. Q. How near were you to Lieutenant Bender during the action? A. Within about ten or twelve yards. Q. Before you were wounded, did you hear Lieutenant Bender encourage his men and see him lead them towards the action? A. Yes I did several times. Q. Did you hear Lieutenant Bender order the men to charge? Q. What are the expressions of which he made use in encouraging his men? A. He cried, come on boys, come on, (waving his sword in the air,) and follow me. A. About half an hour. Q. Was it after Captain Tallon was wounded, that you saw Lieutenant Bender lead the charge? Q. Did you remain any time on the field after you were wounded and how long? A. Till the action was over. Q. Within what distance of the enemy, did you see Lieutenant Bender lead the men? A. Within about fifty yards. Q. After you were wounded, did you still continue to see him encourage the men? Q. Did he behave with courage during the whole of the action? A. In every respect becoming an officer and gentleman. Q. Did you remain on the field, until the action was over? A. I did remain on the field as much as two or three hours after we took ground to the left. Q. Did you see a horse in front of the ravine? Q. If from the time the action began and that the movement was made to the left, there had been a horse and sled, must you not have seen it? Q. What number of men remained dead on the right? A. As many as eighty or ninety. Q. Were you at the attack on Sandusky in August, 1813, if so, to what subdivision and company did you belong? A. To the grenadiers, second subdivision. Q. State to the court what took place, when you marched to the attack. A. We advanced to the right angle of the Fort, the fire was so heavy that we were ordered to secure ourselves, we laid down, at the same time I saw Mr. Bender coming up with his division cheering them along. Q. Did any of the troops give way, when you were going from the left, to the right? A. Part of the second and third, and some of the fourth subdivisions. Q. How near were you to the right angle of the Fort, when you saw Lieutenant Bender coming up? A. Within about thirty or forty yards? Q. How far were you from Colonel Warburton, when you arrived at the right? A. Not above a yard or two. Q. Was Captain Chambers with Colonel Warburton at the time? A. No he did not come up, until five or ten minutes after. Q. Did you hear Captain Chambers say anything to Colonel Warburton? A. No, I did not hear him say any thing. Q. How near to Colonel Warburton was Captain Chambers, when you arrived on the right? A. Within a yard or two. Q. Was there any firing from our troops, when you arrived on the right? Q. How long was it after you arrived on the right, that you received orders to secure yourselves? Q. Was Captain Chambers with Colonel Warburton at the time you received orders to secure yourselves? Q. Did you at any time after you arrived at the right, or at any time afterwards, hear Captain Chambers say, that he would go to the rear and collect the men? Q. Had Captain Chambers said any such thing to Colonel Warburton, were you not near enough to hear him, and must you not have heard him? Q. What is the usual tone of voice of Captain Chambers? A. A loud tone of voice. Q. Did you lie down with Colonel Warburton under the bank, and did Captain Chambers lie down with you at the same time? A. Not directly, but in the course of five or ten minutes after. Q. Where did Captain Chambers go to, during the five or ten minutes you have mentioned? A. I never saw him leave the place. Q. Could he have left the place without your knowledge? Q. How long did he remain in the place you have mentioned? A. Till about nine o’clock in the evening. Q. Did you see Lieutenant Bender come up to the place where Colonel Warburton was behind the bank? Q. How long had Colonel Warburton been under the bank when Lieutenant Bender came up? * The Witness was here asked by Lieutenant Colonel Moodie, a Member of the Court, if he was sure that what he said was true? The [remainder on page 70] question was repeated by the Lieutenant Colonel in a very emphatic manner, and the Witness as emphatically asserted, that he spoke the truth. nel Warburton, when Lieutenant Bender came up, and where did Lieutenant Bender lie down? A. Captain Chambers was about two or three feet from Colonel Warburton, and Lieutenant Bender laid down within two or three feet of Captain Chambers. Q. Did you hear Colonel Warburton say any thing about Lieutenant Bender, when Lieutenant Bender came up to the bank? Q. If Captain Chambers had told Colonel Warburton in his usual tone of voice, that he had found Lieutenant Bender behind a log, could he have done it without your hearing him? Q. Did he before, or after his arrival, say any thing about Lieutenant Bender’s having hidden himself behind a log? Q. During the time which elapsed between the arrival of Captain Chambers and that of Lieutenant Bender, could Captain Chambers have gone two or three hundred yards to the rear? A. It was not possible, and he did not absent himself. Q. When Lieutenant Bender arrived, did he appear to speak to the officers in the usual way? Q. Do you recollect, were the officers under the bank with Colonel Warburton, if so, state at what distance they were from each other respectively? A. Lieutenant Bullock was about two yards from them, Ensign Proctor was close at his feet; Captain Dixon was about two or three yards from Colonel Warburton, I myself and Serjeant Andrew White, and other Serjeants, were within a yard or two of Colonel Warburton. Q. How long did Lieutenant Bender remain with Colonel Warburton, and those under the bank? Q. Have you any knowledge of two men been killed near you, while Lieutenant Bender was under the bank? A. Yes, they were killed about three or four yards from me. Q. Did these two men belong to the grenadiers, or to the battalion, and were they killed when lying down or standing up? A. They belonged to the grenadiers - they were killed when standing up. Q. Did you hear any conversation between Colonel Warburton and Lieutenant Bender, if so, state what it was? Chambers, that if the enemy would sally out of the Fort, they would take them all prisoners, for there were no men there to support them. Lieutenant Bender volunteered his services to go and collect some of the men for their assistance. Colonel Warburton observed also at the same time, that he, Mr. Bender, would be in danger of being killed, but Mr. Bender persisted in going. Q. When Lieutenant Bender went away from the bank, was, or was he not, very much exposed to a heavy fire from the enemy? A. He was very much exposed. Q. Did the enemy keep up a continual fire, or did they only fire when they saw our men exposed? A. Only when they saw our men exposed. Q. What direction did Lieutenant Bender take, when he so left Colonel Warburton to go to the rear? A. The rear of the ravine. Q. Could you see the place over which Lieutenant Bender passed, on leaving Colonel Warburton, and how far could you see? A. I could see it for the space of one hundred, or one hundred and fifty yards. Q. Were there any log in his way when he left Colonel Warburton? A. Only one in the bush, when I retreated myself, I stumbled over some kind of log. Q. What distance was there from the place where Colonel Warburton was, to the bush you mentioned? A. About one hundred and fifty yards I suppose. Q. Was there any log between the place where Colonel Warburton was, and the bush? Q. In what manner was it that Lieutenant Bender proceeded to the rear after leaving Colonel Warburton, did he run or creep on his belly? A. He ran, he did not creep on his belly to my knowledge. Q. Was there not a swamp in the direction Lieutenant Bender took on leaving Colonel Warburton; if so, what distance was it from Colonel Warburton, and did you and Lieutenant Bender sink into it? A. It was about one hundred, or more, yards from Colonel Warburton, I saw Mr. Bender sink into it and fall. Q. Was Lieutenant Bender always within your view, from the time he left Colonel Warburton till he reached the swamp? Q. When Lieutenant Bender fell into the swamp, did you see his hat fall off? Q. Did his hat fall at any distance from him, so as to be out of his reach? Q. Do you know if any person was near Lieutenant Bender when his hat fell off, if so, who was that person, and did Lieutenant Bender ask him to pick up his hat? A. There was a man by the name of Prangle, to whom Mr. Bender’s hat was nearer than to himself, and Mr. Bender asked him to pick it up. Q. Did you hear Lieutenant Bender say any thing to Prangle about his hat, if so, state what it was? A. I heard him say nothing, but asked to pick up his hat. Q. What was Prangle’s answer? A. I did not hear Prangle make any answer. Q. What time did Lieutenant Bender take to extricate himself from the swamp, and during the time he remained there, was he exposed to the fire of the enemy? A. He was two or three minutes, and very much exposed. Q. Did you hear any thing said among the officers, when Mr. Bender fell? A. I heard Colonel Warburton observe, that he was afraid poor Bender was shot. thing after he had gotton [sic] out of the swamp, if so, relate what it was? A. I heard him call to Captain Chambers and Colonel Warburton, saying, that General Proctor wanted them. Q. Did any one answer Mr. Bender, who was that person, and what said he? A. Captain Chambers said, that if General Proctor wanted them, he might come, they were not going to expose themselves to the enemy’s fire. Q. Had you any communication with the Prisoner, respecting the evidence you were to give, before the charges were exhibited against him, or prior thereto? Q. Has the Prisoner, or any person on his behalf, held out any reward to you, to give your testimony in any particular manner? Q. Have you not had particular conversation with the Prisoner’s Counsel, since his arrival in this place? Q. Have you not had communication with the Prisoner’s Counsel, at the bar of the Union Hotel? A. I saw him once there, not privately. Q. You have stated, that in the action of the 22d January, 1813, you heard Lieutenant Bender encouraging his men, was it before or after the charge? A. Both, before, after and during the charge. Q. How often did the men charge? A. Only once, and it had no effect. Q. How long after the commencement of the action, was the charge made? A. About two hours and a half. Q. How long was it after the charge, that Captain Tallon was wounded? A. He was wounded before the charge. Q. Did you not see Lieutenant Bender quit his station on the right, on that day, and if so, for what purpose? Q. If he had quitted his division, must you not have seen him? Q. On what part of the field were you wounded, and where did you remain after you were wounded? A. At the last charge over the ravine, near the enemy, and I remained in the same place. Q. In the place were you remained, could you see Lieutenant Bender, and did he still continue to encourage his men? A. I saw him and he still encouraged his men, I was within two or three files of him. Q. When the men took ground to the left, what distance did they go? A. They went out of my sight. Q. How long after you were wounded, did you see Lieutenant Bender continue to encourage his men? A. As far as I could see him. Q. Did the troops take post behind some barns? A. I saw them going to the barns, but did not se them after they got there. Q. Did Lieutenant Bender accompany them to the barns? A. Yes, as far as I saw him go. Q. Was there any Artillery posted in front of the line, previous to the charge you have mentioned? Q. From whence was the ammunition for this Artillery procured? Q. Where did the Artillery remain, after the charge was made? A. Those that had men to take them away, went with the line, there were two guns to the best of my knowledge, left in the field, in front of the ravine. Q. How long were they in front of the ravine? A. Till the enemy surrendered. Q. How long did you remain there yourself? A. Till after the enemy surrendered. Q. Can you positively say, that no ammunition accompanied the guns, which were in front? A. I did not see any. Q. Did you see Captain Mockler pass along the front of the ravine, after the men had retreated? A. I did not see him in the field. Q. If he had passed that way, must you not have seen him? A. Had he passed in front of me, I should. Q. In the action at Sandusky, did the right wing pass in a line parallel to the right angle of the Fort, if so, at what distance? A. They did at thirty or forty yards distance. Q. How far was the edge of the ravine, from the Fort? A. About thirty or forty yards. Q. You have stated, that two men were killed behind the bank, while standing up; did you see them when they received their wounds? Q. When you saw Lieutenant Bender call to Prangle for his hat, did you hear Colonel Warburton say any thing, and what? A. I did not hear him say any thing. Q. Did any other officer advance at the River Raisin, at the time Lieutenant Bender made his charge? A. None that I saw. Q. How near did you approach the picketing? A. Within about twenty or fifty yards. Q. At Sandusky, how near did you see Lieutenant Bender approach the Fort? Q. What distance was Lieutenant Bender from the ravine, when you saw him fall? A. About one hundred yards, from that to one hundred and fifty. Q. Were you standing up at the time? Q. Did Prangle go with Lieutenant Bender from the ravine, or was he lying in the swamp? A. To the best of my knowledge, he went after him. Q. Was General Proctor near Lieutenant Bender, when he fell? Q. Did Lieutenant Bender bring up any men with him, when he volunteered that service? Bender left Colonel Warburton, to go and collect men? Q. If any other officer besides Lieutenant Bender, had advanced to the charge, at River Raisin, would you not have seen them? A. I think I should. Q. How soon after the action began, (at River Raisin,) were you wounded, and were you not insensible when you were taken up? A. About two hours, or two hours and one quarter after the action, I was sensible enough when I was taken up, only I was cold. Q. Did you hear Captain Chambers remark any thing to Colonel Warburton, respecting Mr. Bender, while you lay near them at Sandusky? Q. Were the banks of the ravine equally high on both sides? Q. Did you see Mr. Bender at the time he cried to Captain Chambers and Colonel Warburton, General Proctor wanted them? Q. For what puspose [sic] did you go to the Bar of Union Hotel when you saw the Prisoner’s Counsel there? A. I went to speak to General Proctor. Q. Did Lieutenant Bender come back after he went to the rear, at Sandusky, to collect men? Q. Have you been in the 41st Regiment, and when were you discharged? A. I have been in the 41st sixteen years, I was discharged on the 26th May last. Q. Were you on the 22d January, 1813, at River Raisin, and had you any share in the action? A. I was there; I was not in the action, but was driving a King’s horse and sleigh with spare ammunition for each gun - I was stationed within fifty or sixty yards in rear of the guns. Q. How far were you stationed from the place where the wounded were? A. About four hundred yards. Q. Did you at any time during the action go where the wounded were? Q. Do you know if there was a ravine in front of the enemy. A. There was a ravine, rather inclining to the left. Q. Were you in rear of the ravine, and how far? A. I was, as far as I can judge, about two hundred yards in rear. Q. How long did you continue there? A. I cannot exactly tell, it was the best part of the time the action lasted. Q. While you were there, had you in charge a horse and sled with ammunition? Q. Did you see Lieutenant Bender at any time, and how long after the action began? A. I saw him about twelve o’clock, at the side of the ravine, and I asked him which was the nearest way to our troops under arms, and to the ammunition works. Q. Did he tell you to bring the sleigh there? * Immediately after Serjeant Stagnell had given his testimony, he was confined to the guard house. The other Witnesses for the Prisoner, soon became informed of his imprisonment. Although no crime was alleged against him, he was detained until the rising of the Court, which took place about ten days afterwards. A. He told me to come along, and he would show me the way; he went along in front of the horse, walking as hard as he could. Q. State what took place afterwards. and Mr. Bender assisted me to let the horse and sleigh through, we got up to the place where the troops were and there we continued until I was ordered home. Q. Where did you find the troops? A. Behind some old log houses, sheltered from the enemy’s fire. Q. How long was it before the enemy surrendered, that you came up with the sled? Q. Were the houses you have mentioned, to the right, or to the left of the enemy? Q. Did you see General Proctor there when you arrived? Q. Was the ammunition taken out of the sled, when you arrived where the troops were? A. It was in about the course of an hour after we arrived. Q. When Lieutenant Bender first met you, did he ask you if you had any ammunition? Q. Was the ammunition in a magazine, such as is commonly used for ammunition? A. No, it was in a quarter cask, hooped with a head to it, it was full of ball cartridges. rive as soon as possible at the place where the troops were? Q. In going to where the troops were, were you exposed to a heavy fire? Q. Did Lieutenant Bender appear to you to be the least afraid, or did he shelter himself from the fire? A. Not in the least that I observed. Q. Did he go in front of the horse and sled? A. In front during the whole time. Q. What time did it take you to go from the place where you met Lieutenant Bender, to the place where the troops were? A. About three quarters of an hour, as near as I can guess. Q. Was Lieutenant Bender exposed to the whole of the fire of the enemy, during that time? Q. Did he act as a brave officer? A. He did act in a manner becoming both an officer and a gentleman. Q. In going to where the troops were, did you pass a bridge that was on the Ravine? were, would that bridge be to your right or to your left? A. It would be to my right. Q. Did you drive the horse and sled the whole of time? Q. Could Lieutenant Bender have put himself under shelter, during any part of that time without you seeing him? Q. Before you saw Lieutenant Bender, did you see Captain Tallon any where, and if so, where? Q. When you first saw Lieutenant Bender, did he appear to you to be coming from the ravine? Q. From what place did it appear that Mr. Bender came? A. He appeared to have come from the place where the engagement had been, he appeared to me to have been in search of me. Q. Did you see in the rear any man not wounded? A. No, none at all. Q. In going to where the troops were, did you make a halt for any other purpose than making a passage for the sled? Q. Did General Proctor see you arrive with the sled, and did he say any thing to you, and what? A. Yes, he saw me, but said nothing. Q. Where was the ammunition put, when taken out? Q. Were not the whole of the troops under cover, when you arrived? A. Scattering about and under cover too. Q. Was the horse a tractable, or ungovernable horse? A. Very wild and fractious. Q. Had it not been for that circumstance, would you not have arrived much sooner? A. Not much as we had a fence to take down. Q. Do you know that in the action of 22d January, the troops were ordered to charge the enemy behind the picketing? Q. Did you advance at any time across the ravine with the sled under your charge, except when you crossed it by the bridge? Q. When you were going with the sled, did you pass the front of the ravine? Q. Did you pass over that part of the ground in front where there was a picketing? Q. Did you pass along in a line with the picketing? Q. Did you see any wounded men in your way, besides the one you have mentioned? Q. You stated that you was [sic] stationed in front of the ravine, how could you be so, without passing the ravine? A. I did pass the ravine once, over a small bridge. Q. What part of the troops were stationed in front of the place where you were stationed? A. There were some men of all descriptions, Indians, Militia and 41st Regiment. Q. How was the ammunition for the guns packed? Q. At what time of day did you take your station, two hundred yards in the rear of the ravine? Q. Where were the guns, when you were two hundred yards in the rear of the ravine? A. One was near the Surgeon, and the remainder close by the American Garrison. Q. Did you see Captain Mockler during the action on that day? Q. At what time of day did the enemy bring out the white flag? Q. Was there any other sled with the army except the one you had? A. Not at the time I went where the troops were. Q. Where had you been before you took your situation in rear of the ravine? A. I was fifty or sixty yards in rear of the guns. Q. Was there any other man of the 41st who had charge of a horse and sled, besides yourself, that day? A. There was an inhabitant, a hired man, he went to the field, but returned before I got to the field. Q. What distance was it from where you met Lieutenant Bender, to where General Proctor was? A. About half a mile, as near as I can judge. Q. Was your horse wounded at all during the action? Q. What was on the other sled? Q. Was there a field magazine on the other sled? Q. Was the other horse wounded? A. He was wounded in the fore foot. Q. Were you at any time absent from the horse and sled? Q. When you were going to the barns with Lieutenant Bender, from how far were the enemy firing? A. Within a quarter of a mile, within musket shot. Q. At what distance were the great guns from the garrison? A. About a quarter of a mile, as far as I can judge. Q. Were the enemy firing at you when you passed the picketing? A. They fired from the cross-railing, when we made the gap for the horse and sled to get through. Q. Where did you leave the guns when you went with Lieutenant Bender to the field? A. I left them in the field, when I was ordered back to the gap where the ammunition was left before the action, the gap was quite in the rear of the field. tached, after you were ordered back to the gap for ammunition? Q. Were you at the attack on Sandusky, on 2d August, 1813? Q. Did you command any subdivision, and to what wing, right or left, did it belong? A. I commanded the fourth subdivision of the division Mr. Bender commanded, I belonged to the right wing. Q. State to the Court what you know of Lieutenant Bender’s conduct on that day. was Colonel Warburton; he was pretty near the picketing, protected by a small rise of ground. Q. What occasioned the breaking of the troops? A. I suppose it was the overwhelming fire from the left angle of the Fort, while we were passing it. Q. Did you see Lieutenant Bender when the troops broke, and what was it you saw him do? A. I saw him encouraging his men, both by word and action. Q. Did it, or did it not appear to you, that Lieutenant Bender did every thing in his power, to bring on his men? Q. When you saw him encouraging the men, was, or was not his conduct that of a brave officer? Q. How far was he from the Fort at the time, was he nearer to it than his men, or were his men between him and the Fort? A. Between forty and sixty paces from it, perhaps more, he was between the men and the Fort. Q. Was he at the time exposed to the fire of the enemy? Q. Do you recollect the expressions he made use of in encouraging his men, if so, state what they are? of, he made a number of gestures, he spoke a good deal. Q. Do you recollect having heard him say, “come on boys, come on,” or words of a similar meaning? A. I dont [sic] know whether he made use of those expressions. Q. Do you recollect seeing him waving his sword, and pointing with it to the Fort? A. I recollect seeing him wave his sword. Q. When you reached the place, where Colonel Warburton was, how far did you find Colonel Warburton from the Fort? Q. Can you say how long Colonel Warburton had reached the place before you? A. He could not possibly have been long, he had just sat down there. Q. Had he reached the right angle, three, four, or five minutes before you? A. I cannot exactly say, but it was a very short time. Q. When you arrived at the place were [sic] Colonel Warburton was, did you shelter yourself with him under the bank? Q. How near to Colonel Warburton did you lie down? A. Close to his feet. Q. Did you see Captain Chambers when you came up to Colonel Warburton to lie down? Q. Did you see Captain Chambers there at any time after you had laid yourself down, if so, how long after was it, that you first saw him? A. He came up three or four minutes after. Q. When Captain Chambers came there, did he lie down also, if he did, was it near, or far from Colonel Warburton? A. When he first came, he stood bent and then laid himself down near Colonel Warburton. Q. When you came up to where Colonel Warburton was, did you see Lieutenant Bender there? Q. Did you see him there at any time after you came up, if so, state how long it was after you came up, that you saw him there? A. I saw him come up two or five minutes after Captain Chambers, he followed him. Q. Did he lie down with the others? A. He laid down about a minute after he arrived. Q. How long did you remain, and how long did Colonel Warburton remain, in the position you have described? A. Until about eight in the evening, when the troops had gone off. Q. Did you hear Captain Chambers at any time after his arrival, or after that of Lieutenant Bender, say any thing about having found Lieutenant Bender under a log? Q. If he had said any thing, must you not have heard it? A. I think I must, unless he had whispered, or gave it in writing; a report of that kind must have struck one, I was near enough to hear him if he had spoke in his usual tone of voice. Q. How long did Lieutenant Bender remain with you and Colonel Warburton under the bank? A. I think less than half an hour. Q. While he remained there, was there any coolness manifested towards him, by any of the officers then present? Q. Did not he and his brother officers, appear to act together as usual? A. I saw no difference. Q. After the troops on the right had concealed themselves, did they on that day, come into action? A. There were some shots fired from behind the bank. Q. Were there shots fired when you arrived there? A. When we were lying down - Colonel Warburton desired them to stop. Q. What was the cause of Lieutenant Bender’s leaving the bank, and whither did he go? A. There was a remark made by Colonel Warburton, or some other officer, that if the enemy advanced, they would cut us to pieces, before we received assistance from the rear. Mr. Bender made an offer to go and collect the men in the rear. I afterwards saw him go. Q. Before Lieutenant Bender left the place under the bank, had any person been sent towards the Fort, to watch the motions of the enemy? A. Colonel Warburton told one of the grenadiers to go close to the Fort, and give information if any attempt was made to sally out. Q. Did the enemy keep up a continued fire, from the time you sheltered yourselves under the bank? A. They only fired at those who shewed [sic] themselves. Q. On leaving the place behind the bank, was Lieutenant Bender fired at? Q. From the time he left the bank, how long did he continue exposed to the fire? Q. While exposed to the fire of the enemy in going to the rear, did you see him creep on his belly? A. I am not quite certain, I believe he endeavoured to cover himself as well as he could. Q. Were not those under the bank, where Lieutenant bender had been, perfectly secure from the fire? A. They were as long as they remained quiet. Q. Did you see Lieutenant Bender get embarrassed in a swamp, and was he, while in the swamp, exposed to the fire? A. I saw him in low ground, I cannot say whether it was a swamp - he seemed embarrassed while there, he was exposed to the fire of the enemy. Q. Did he fall in the low ground, and were there any observations made by the officers? A. I heard it said he was killed, he fell down after some shots were fired. Q. Did you hear Lieutenant Bender crying out? A. I think I could distinguish Mr. Bender’s voice, saying that the General wanted Captain Chambers and Colonel Warburton in the rear. - Captain Chambers made some answer, but I cannot say exactly what it was. Q. At the time you retreated from behind the bank, was the moon up. Q. Were not the troops ordered to wait until the moon had hidden itself behind some clouds? A. They were recommended to wait until the moon was obscured by a cloud. Q. Did you take the same direction in going from the bank, that Lieutenant Bender took? Q. How far was it from the place where the troops broke, to the place where Colonel Warburton was under the bank? A. About one hundred and fifty paces as we went. Q. Did you see Lieutenant Bender after the moment that the troops broke as you have described? Q. Did any man go with him to the rear? A. To the best of my recollection there was none. Q. Did Lieutenant Bender return to the bank? A. He never came back. Q. Did you see Captain Chambers quit the bank after you first saw him there, until the whole retreated? A. I am under the impression that Captain Chambers went away before the last retreat, after Mr. Bender had gone to the rear. Q. How long after the troops broke, did Lieutenant Bender join Colonel Warburton in the ravine? A. About six or ten minutes. Q. Were there any men with Lieutenant Bender or Captain Chambers, when they came up to where Colonel Warburton was? A. About three or four. Q. Did you hear Captain Chambers tell Colonel Warburton he would go to the rear to collect the men? A. I do not think I did. Q. Did you see Captain Chambers at any time during the advance to the ravine? A. I did not see him until I saw him in the ravine. Q. Did you hear the word given for every man to secure himself? A. I heard Colonel Warburton tell the men to keep close under the bank. Q. Was it before, or after the arrival of Mr. Bender under the bank? Q. Have you been a soldier in the 41st Regiment - how long, and when discharged? A. I have been sixteen years, and discharged 24th May last. A. In one general action. Q. Were you in the action at River Raisin, on 22d January, 1813, in the right or left wing, and what division? A. In the right wing, in Captain Muir’s company. Q. Who were the platoon officers on the right, at the commencement of the action? A. Lieutenant Bender, second grand division, and Captain Tallon, first grand division - I know no other officers. Q. Do you know that Serjeant Dukes was Lieutenant Bender’s covering Serjeant? Q. When did the action begin, and how long did it last on the right? A. The action began at day break, I left the field before the action was over on the right, being wounded. Q. How long after the action commenced, were you wounded? Q. How far were you from Lieutenant Bender during the action? A. Ten or twelve files. Q. Had you an opportunity of seeing Lieutenant Bender during the action? A. Not during the whole of the action, but I heard his voice several times, after I was wounded. I saw him and spoke with him. Q. When you heard Mr. Bender speak, what did he say? A. He used encouraging words to the men. Q. When you were wounded, what did you say to Lieutenant Bender? A. The fire at that time was very heavy, I called out several times to him, saying that I was severely wounded, and should leave the field: he told me he could give me no assistance, that I must go to the Doctor, for that he himself expected to be knocked down every moment. Q. Did he appear to you cool and collected at the time? Q. Was not the fire very heavy from the enemy at the moment? A. It was very heavy. Q. How long did you remain wounded in the rear of the line, before you left the field? Q. During that time did you see Lieutenant Bender? A. I did, it was during that time I called to him. Q. Did you hear him encouraging his men, and see him lead them to the charge? A. I heard him encouraging his men to keep on firing, they did not charge during that time; the word charge was repeatedly called, during that time, along the line, from right to left. I do not know who began the word. Q. Did the General come to the rear of the line, while you were lying wounded there? A. He did, and told me to go to the Doctor, shewing [sic] me where he was. Q. When you were lying, what officers did you see on the right wing beside Lieutenant Bender? A. I do not recollect seeing any. Q. When Lieutenant Bender told you to go to the rear, did you go accordingly? A. I did, as soon as I could. Q. Do you know that Captain Tallon was wounded in the beginning of the action, and did you see him in the rear among the wounded? A. Captain Tallon was wounded - when I got to the rear, I heard he was gone home. Q. Did you see in the rear among the wounded, any who were not wounded? A. I saw some with the Doctor assisting him, who I believe were not wounded. troops attempted to charge the enemy, who were behind the picketing? A. I was not, I had been wounded before that. Q. Did you see any sled, and of what description, in the field? A. I saw Nettles, the king’s carter, with a sled with ammunition. Q. Was there any one with Nettles? A. I saw no one. Q. Did Lieutenant Bender leave his division during the action while you were with it? A. It is possible, he might. I have said I did not see him during the whole of the action. Q. While you were in the rear among the wounded, did you see Lieutenant Bender there at the time the action was going on? Q. How long have you been in the 41st? A. Seventeen years next October. A. Eight or nine times. Q. How often have you been in action with Lieutenant Bender? Q. What were those actions? A. River Raisin, Miami Rapids, Brownstown, and Buffalo. Q. At the action of 22d January, in what wing, and in whose company were you? A. I was in Lieutenant Bender’s division, in the right wing. Q. What distance were you from him? A. Four or Five [sic] files in the rear rank. Q. Who was Lieutenant Bender’s covering Serjeant? A. I was wounded before it ended, it commenced one hour and a half before I was wounded. Q. Did you leave the field before, or after the troops charged the enemy behind the picketing? Q. At what distance were you engaged at the time Lieutenant Bender went in front to pick up the firelock? A. About two hundred yards. Q. Were the enemy at the time firing with musketry; or artillery? Q. Did you during the action, see a horse and sled in front of the ravine? Q. Were you in the action at River Raisin, on 22d January, 1813, and in what capacity? A. I was Aid-de-camp [sic] to Colonel, now General Proctor. Q. What was the strength of the right wing, and who were the platoon officers? A. I cannot exactly say; there were altogether in the field one hundred and twenty one rank and file of the 41st, they were divided into two wings nearly equal. The platoon officers were Captain Tallon, who commanded the right wing, and Mr. Bender, who commanded the second division. A. Two hours and a half, I think. Q. Did you, or Colonel Proctor, leave the field during the action? Q. Had you an opportunity of witnessing the conduct of Lieutenant Bender during the action? A. The second division fired, without being commanded. I saw Mr. Bender endeavouring to prevent them. I saw him afterwards about five or six minutes, previous to the retreat, advance about six or seven yards, and pick up a firelock. I afterwards saw him, while retreating to the ravine, collecting his men. Q. Was, or was not, the fire of the enemy, while he advanced to pick up the firelock, very heavy? A. It was the heaviest fire during the action. Q. Did you hear, or see him encouraging his men? A. I could not hear him on account of the noise. Q. Did he leave his division during the action? A. No - not to my knowledge. I do not think he could have done it without my observing him. Q. From what you have seen of Lieutenant Bender’s conduct during the action, would you, or would you not, think him capable of misbehaviour before the enemy? A. No, I would not think him capable. Q. Did the troops retreat to the ravine, in consequence of an order to that effect? A. Some retreated without an order, having broken before the order was given. The ravine was about one hundred yards from the enemy. Q. Where did the men go, who had broken before the order was given? A. They went to where the Surgeon was. Q. At the time of the retreat, what were the orders? A. The orders were to retreat to the ravine and take ground to the left. Q. When in the ravine, did you give any orders to Lieutenant Bender? A. When in the ravine, I remember asking Mr. Bender what became of the men. I desired him to go to the rear and collect them - I told him to bring up ammunition. I do not recollect whether it was in the ravine, or if I called to him afterwards. Q. Did Lieutenant Bender proceed to the rear accordingly? Q. Did the troops in the mean time, take ground to the left, and what took place? A. They went on towards the left, and took cover under some houses and barns. Q. Did any of the troops remain in the ravine, after your arrival on the left? A. There might have been some. Q. What was the strength of the right division at the time of the retreat? A. I suppose not above twenty or thirty men. Q. Do you know whether Lieutenant Bender sent, or brought up any men from the rear? A. Some men were sent up from the rear - I know not whether Mr. Bender sent them; there was no other officer in the rear. Q. Was it after your arrival on the left, that the men came up? A. Some came up during the retreat, and some after our arrival. Q. Do you know if any ammunition was brought up after your arrival? A. Yes, one sled with ammunition, in a quarter cask, and the men were ordered to supply themselves. I think the driver was Nettles. Q. Did you see Lieutenant Bender there at the time? A. I do not recollect who were the officers on the left. Q. Was the action continued after your arrival on the left? A. No, there were some men firing from behind the barns, contrary to orders. Q. What was the nature of the ground in front of the ravine? Q. While in the ravine, and taking ground to the left, did you see a horse and sled in front of the ravine? Q. Had there been at the time, a horse and sled in front of the ravine, must you not have seen it? A. I think I must. Q. How long after your arrival on the left, did the enemy surrender? Q. After they had surrendered, did you give any, and what orders? A. I gave none that I recollect. Q. Did you after the action, give him orders to number the dead on the field? Q. What was the distance from that part of the field occupied by the right wing, to the barns on the left? A. About four hundred or five hundred yards. Q. Were you in the action at Sandusky, on the 2d August, 1813, and in what capacity? A. I was as Brigade Major to General Proctor. Q. Did you see Lieutenant Bender after the troops advanced to the right angle of the Fort, and when and where? hat, a few minutes after, he picked it up and put it on; this was a little before sun set, about twenty yards from where Captain Chambers and Colonel Warburton were. Q. Did you see a man by the name of Prangle, near him at the time? A. I think I did, a little on his right, one pace or two. Q. In coming to the place where you saw him, did you meet with any officers? A. I met the Adjutant a little farther, with about twenty men under cover. Q. For what purpose did you go to the place where Mr. Bender was, and what took place after you saw him? or two and called Captain Chambers, and then told him that General Proctor’s orders were for Colonel Warburton to bring off the troops - He answered, it is impossible; how can I until after dark. Q. At what time did the troops retreat from the right angle of the Fort? A. It was between eight and nine o’clock. A. The moon was up, but they were obliged to wait the opportunity of the moon being covered by a cloud. Q. At the action at River Raisin, did you advance at the charge of the enemy behind the picketing? Q. Did you see Lieutenant Bender advance with his division? A. I could not tell who the officers were with the division. Q. When did you first see Lieutenant Bender, after the retreat to the ravine? Q. How long before the charge, had you last seen Lieutenant Bender? A. I saw him when his division was advancing to form in line. Q. Did the line remain some time before they charged? Q. Did you see Captain Mockler come into the ravine, if so, was it before, or after you saw Lieutenant Bender collecting his men? A. I think I saw him in the ravine, I do not recollect if it was before, or after I saw Mr. Bender collecting his men. Q. Had the enemy retired behind the fence at the time you saw Lieutenant Bender pick up the firelock? A. They were then firing from the picketing through holes. Q. How far were the troops from the fence, when he picked up the firelock? A. About sixty or seventy yards. Q. Were you near the division which Colonel Warburton commanded, when he advanced to attack Fort Sandusdy [sic] ? A. I did not go with the right division. Q. Did you see the troops lying behind the bank when you spoke to Captain Chambers? A. I saw some, but not there. Q. Did you either in the action at River Raisin, or at Sandusky, see any thing improper in Lieutenant Bender’s conduct? Q. Did you observe a horse and sled in front of the ravine, during the time of the action on the right, and after the Newfoundland Regiment had charged? A. I saw none between our line and the enemy. Q. Were you at the attack on Sandusky, on the 2d August, 1813? Q. Were you in the right, or left wing? A. In the right wing. Q. State what happened on your advance to the Fort. A. The second division of the right wing broke, and shortly after they were desired to cover themselves, by order of Colonel Warburton. Q. Did you see Lieutenant Bender when the troops broke, and what did you see him do? A. I saw him ten or fifteen minutes after, at some distance from me, rather to my right, with his hat off. Q. How far were you from the right angle of Fort [sic] at the time? A. I think about one hundred yards. Q. How far was Lieutenant Bender from the right of you? Q. When you saw him, was he above the bank? A. He was above on the bank, on the other side. Q. Were there any men with you at the time? Q. Do you know where Colonel Warburton then was? A. I did not see him, but I know he was farther to the right. Q. Had he reached the right angle? Q. Did you see Lieutenant Bender at any time afterwards? A. No, not until dark. Q. Did you see Captain Chambers? Q. Could Captain Chambers have passed, either in front, or behind the ravine, without you seeing him? A. He could not have passed in the ravine without my seeing him. Q. Were you ever in action with Lieutenant Bender, after the attack on Sandusky? A. I was at Black Rock. Q. Had you an opportunity of witnessing his conduct there? Q. Did the ravine at Sandusky, run parallel with the right face of the Fort? A. From the right angle, it ran obliquely off to the left. Q. When you saw Lieutenant Bender in the advance, was he on the side of the ravine, nearer to the Fort? A. No, on the other side. Q. On which side of the ravine, did the troops advance? A. On the side next to the garrison. Q. When you saw Lieutenant Bender on the other side of the ravine, did you see any men with him? A. No, the men were lying round to the right and left where I was, but I did not see him there. Q. Where was the division of which he had the command on the advance? A. They were broke going round. Q. How far from the Fort, was Lieutenant Bender when you saw him on the other side of the ravine? A. About forty or fifty paces. Q. How long after the troops broke was it, they received orders to cover themselves? A. About five or ten minutes. Q. How far was it from the place where the troops broke, to the place you suppose Colonel Warburton covered himself? A. I suppose two or three hundred yards from the place where the troops broke, to the place where Colonel Warburton covered himself. Q. How far was it from the left angle of the Fort? A. About five hundred yards; I can scarcely judge. Q. Were you an officer of the 41st at the time of that action? A. I was not, I was Serjeant Major. Q. Did you command a division? Q. How long have you been in the 41st, and how often in action? A. Six years in the 41st, and three times in action. Q. Were you at the action at River Raisin, on the 22d January, 1813, on the right or left, and in what division? A. I was on the right, in Captain Tallon’s division. A. Quite close to him, next man to him. Q. State what you know of Lieutenant Bender’s conduct during the action. A. He behaved himself like a brave soldier, an officer and a gentleman. Q. did you hear and see him encourage his men? A. At different times, four or five times during the action. Q. What were the words he made use of? A. The americans were going to the right, and Mr. Bender said, fire away 41st you will soon make them all prisoners. Q. Did he leave his division during the action, and could he have done so without your knowledge? A. He did not leave his division and could not have done so without my observing him. Q. Did you hear him encourage the men to charge the enemy? Q. Did you see Lieutenant Bender lead the men to the charge, and did you see him afterwards? A. I did see him lead them to the charge, I did not see him afterwards until I got to the left. Q. Did not some of the men break, some time after the charge? A. We were ordered to retreat. Q. How long after was it, that you saw Lieutenant Bender on the left? A. About one hour, or one hour and a half. Q. Did you see him bring any ammunition to the left, and do you know if he brought any? A. Yes I did he was in front of it. Q. Did you see him with a man of the name of Nettles? Q. Was there any horse and sled? Q. Did you at any time during the action, see Lieutenant Bender advance in front of the line? A. No, he belonged to the division which was in the rear of me. Q. Have you been in any action with Lieutenant Bender, except that at River Raisin? A. Yes, at the Miami Rapids. Q. When was that action fought? A. The 5th of May, 1813. Q. Had you an opportunity of witnessing Lieutenant Bender’s conduct? Q. Did you see a horse and sled in front of the ravine at the River Raisin, when the troops charged? A.. No, none at all. Q. Did Lieutenant Bender’s, or any other division, break before orders for retreat? A. No, not as I saw. Q. You have stated that Lieutenant Bender’s division was in the rear of you, how can you state that he did not leave his division? A. Because when his division came up, he always came up with it. Q. How long have you been in the service, how long a Serjeant, and how long a Colour Serjeant? A. About seventeen years, almost six years a Sergeant [sic], a Colour Serjeant almost two years. Q. Were you at the attack on Sandusky, in the right, or left wing, and in what subdivision? A. I was in the right wing, and in the first subdivision of grenadiers. Q. State to the Court the manner in which the right wing advanced to the attack, and what took place in passing to the right. A. We formed in columns and subdivisions. - Colonel Warburton gave word - the right wing moved off to the right. The first division broke into the woods; the second division broke in like manner; the third subdivision broke, commanded by Mr. Bender, and fourth subdivision broke also: some of the men left advancing and firing. I saw Mr. Bender several times, heard him call to his division and tell them to follow him towards the pickets; they did not mind him, what was left, advanced to the right angle of the garrison under Colonel Warburton. Q. Did you see Captain Chambers and Colonel Warburton at the time the troops broke? A. I saw Colonel Warburton nine or ten paces in front of me, and Captain Chambers about nine or ten paces to my right in the bush. Q. What might be the distance from the place where the troops broke, to where Colonel Warburton was on the right? A. About one hundred yards. Q. To within what distance of the Fort did Colonel Warburton go? Q. Did you arrive with Colonel Warburton on the right , or after him? A. Within a minute or two, as soon as he did. Q. Had you, or had you not, Colonel Warburton always in view, from the time the troops broke? A. I had, he kept about six or seven paces before me. Q. What took place immediately on your arrival on the right? A. I fired the first shot, there were two men killed near where I was, and Colonel Warburton ordered every body to secure himself behind the bank as well he could. Q. From the time the troops broke, until the time they secured themselves, did you see Captain Chambers with Colonel Warburton? A. I saw him about three or four minutes after we had secured ourselves under the bank. Q. Had Captain Chambers been with Colonel Warburton during that time, must you not have seen him? A. I was in the rear of Colonel Warburton, I must have seen him. lonel Warburton under the bank, what did he do? A. He laid down also. Q. What distance were you from Colonel Warburton when Captain Chambers came up? A. Two or three paces. Q. Did you see Ensign Proctor and Serjeant Stagnell there at the time, and how far were they from Colonel Warburton? A. Ensign Proctor was at Colonel Warburton’s feet, and Serjeant Stagnell two or three paces to Colonel Warburton’s right. Q. How far from Colonel Warburton did Captain Chambers lie down? A. Within two or three paces of him. Q. Did you see Lieutenant Bender any time after Captain Chambers came up, and where? A. About nine minutes after Captain Chambers had come up, and more to the left. Q. When Captain Chambers came up, did he come through the ravine, or above the bank? Q. Did you when Captain Chambers came up, or any time after, hear him say any thing to Colonel Warburton about having found Lieutenant Bender under a log? A. I did not; if he had, I think I must have heard him, as he was only two or three paces off. and the other officers appear to act together in the usual manner? Q. How long did Lieutenant Bender remain under the bank? A. About one half hour. Q. What was the cause of his going away, and where did he go? A. There was a discourse among the officers, that if the Americans sallied out, they would cut but a poor figure; upon which, Mr. Bender volunteered to go to the rear to collect men. Q. When you saw Lieutenant Bender volunteer to go to the rear, did you hear Colonel Warburton make any, and what observation? A. He said, if he were to go, he would be shot. Mr. Bender went double quick. Q. Did you see Lieutenant Bender creep on his belly in going to the rear? Q. How far did you see him go to the rear? Q. How long was he exposed to the fire of the enemy after he left Colonel Warburton? Q. Did you see him fall? A. He fell as soon as he had got about one hundred yards off, in a kind of marshy place. Q. When Lieutenant Bender fell, was any, and what observations made by the officers under the bank? A. They all said he was killed. Q. Did Mr. Bender’s hat fall off, and what happened after? A. When he fell down his hat dropped off; he asked a man of the grenadiers to pick it up - the man said he would not, for he was afraid he should be shot. Q. Were there any logs on the ground over which Lieutenant Bender passed in going to the rear? Q. How long did Captain Chambers remain under the bank after his arrival? A. Until eight or nine o’clock, at the retreat. Q. How long did Ensign Proctor and Stagnell remain there after they had first arrived? Q. Did Lieutenant Bender return to the bank during that day? Q. Were you in the action at River Raisin, the 22d January, 1813, on the right or left? Q. Did you see Lieutenant Bender after the action, and were you with him on any, and what duty? A. Lieutenant Bender called on me to go and tell him the names of the men who were killed on the field. Q. Did you go with him through the whole field, between the ravine and the enemy’s position? Q. Did you see a horse and sled in front of the ravine? A. There was a horse dead, tied to a barn near the picketing, but I saw no sled. Q. Was it within the pickets, or on the outside, you saw the horse? Q. How far was it, and was it in the enemy’s camp? A. It was beyond the camp in which the enemy had been, before we attacked them. Q. Was it before, or after the enemy had surrendered, that you went on the field? Q. Was the horse you mention, near a barn, if so, how far was it from the ravine? A. It was near a barn, about one hundred and fifty yards from the ravine. Q. When an order was given to retreat, did you go to the ravine with the rest of the troops? Q. Did you take ground to the left with the Newfoundland or 41st? Q. Did you see Captain Mockler in the ravine? Q. Did he go with you to the left? A. He went before me. Q. When you had taken ground to the left, did you see a horse and sled? Q. Did you see Lieutenant Bender after he had arrived on the left, where some barns were? Q. If there had been a horse and sled in front of the ravine, when you crossed it, would you have seen it? A. I think I should have seen it. Q. Were you ever in action with Lieutenant Bender afterwards, what was his conduct? A. I was with him at the Miami Rapids; he was at the taking of the first prisoners. Q. Did you see a man of the name of Nettles, bring up ammunition, after you had gone to the left? A. No, I did not see him at all. Q. Did you see Lieutenant Bender at any time after the attack, and when? A. About ten or fifteen minutes after, when the men were under cover. Q. Previous to seeing Lieutenant Bender, did you see Lieutenant M’Lean? A. I was directed by General Proctor to go and tell Colonel Warburton, to bring off the troops if possible; on my return I met Lieutenant M’Lean, just as I got into the ravine, he called out to Lieutenant Bender. Mr. Bender made a signal with his hat, as much as to say, not to cross the ravine. Lieutenant M’Lean came to where Mr. Bender was, and I returned to the General. ders to Mr. Bender, to go to where the General was? Q. How long were you Adjutant to the 41st, and what was the conduct of Lieutenant Bender during that time? A. About three years. With respect to his regimental duty, he performed it much to the satisfaction of his Commanding Officer. Q. Do you know any thing of his conduct in action? A. I never saw him, but I heard him, on our advance to Buffalo, encouraging the Indians. Q. Were you in the action at River Raisin, in January, 1813, and in what capacity? A. I was as Colonel on the Staff, Commanding. Q. Had you an opportunity of witnessing the conduct of Lieutenant Bender, during the action? duty, and behaving as an officer ought to do in the face of the enemy. Q. Did you observe him go in front, or in the rear of the line, upon any, and what occasion? A. To the best of my recollection, I saw him step out a pace or two in front of the line to pick up a musket, when the fire was most brisk. Q. Did he leave his division during the action, and could he have done so without your observing it? A. I do not know that he did leave his division, if he did I think I must have observed it, I think I should have missed him if he had latterly; he was the only officer there, besides Mr. M’Lean. Q. Did you hear him encourage the men? A. There was so much noise at the time, that I cannot say. I remember his repeating the word “charge” once. Q. At what period of the action was this? A. It was shortly before our moving to the left, I suppose about a quarter of an hour. Q. Did you go through the ravine with the troops, in taking ground to the left? A. I did as far as the ravine led to the point where I wished to go. Q. When you arrived at the barns, where the men took shelter on the left, did any remain in the ravine? Q. While taking ground to the left before, or after, did you see a horse and sled in front of the ravine? A. No, I think any horse there, must have been shot down, nor do I see what could have taken a horse and sled there. Q. Had there been a horse and sled there, must you not have seen them? A. Yes, I should, I think so. Q. Have you a knowledge that any men came up from the rear, and that any ammunition was brought up to the position on the left? A. I think I remember some men having come up from the rear, and I am certain that ammunition came up, from its having been emptied into a blanket. The men objected to it, as being American ammunition with buck shot in it. Q. From what you saw of Lieutenant Bender’s conduct, would you, or would you not, think him capable of misbehaving in action? A. From what I saw of Mr. Bender’s conduct in the fire, I should think it impossible, he would so far forget himself as to behave himself in a manner unbecoming an officer; the fire was of long continuance, and he appeared to be perfectly collected. Q. Did you see Lieutenant Bender at any time, and when, during the attack on Sandusky? clear, but I think I saw him some time after the business had entirely failed, when I went to the rear of the right. Q. How long have you known Lieutenant Bender as an officer - how long has he been under your command, and what has always been his conduct? A. I do not recollect how long Mr. Bender has been in the 41st - I had never occasion to find fault with Mr. Bender, but have had often occasion to commend his zeal and the desire he has shewn [sic] to do his duty. I was in command of the Regiment when he came to it. Q. Did Captain Chambers, after the affair at Sandusky, make any, and what report to you respecting Lieutenant Bender? A. He did, but from my personal knowledge of the character of the accuser and of the accused, I did not take that notice of it, that I should have done, had it come through another channel; I had my reasons for not attending to it. Q. Was it reported to you after the action of 22d January, that Lieutenant Bender had misbehaved before the enemy? from Captain Tallon on the subject - Captain Tallon was in his quarters wounded at the same time. I at the same time observed that I had seen Lieutenant Bender do his duty, and that I would come forward and say so. Q. Was there not a sled with a field magazine left on the right when the troops moved to the left, and near to where a field piece had been at the commencement of the action? A. I have already said that I saw none in front of the ravine. uation, will, I flatter myself, operate as a sufficient excuse. Before I proceed to offer any observations on the evidence now before you, I beg leave to be indulged with the remark, that that evidence deserves more or less weight, is entitled to more or less credit, from the character and motives of the witnesses on either side. - The witnesses on the part of the prosecution, can by no means be considered as impartial. I do not mean to include Captain Tallon, even if his evidence stood uncontradicted, it must hinge entirely on that of the first witness. It cannot, however, be considered to corroborate it, as it does not go to the same fact: on the contrary it places me with the wounded in the rear, at the same period that Captain Mockler said that he saw me in front of the ravine. - Captain Mockler and Captain Chambers, have no doubt an interest in my conviction. - The former feels it necessary for his character, to be consistent with himself, and to maintain now before the Court, in the shape of a charge, a report which originated with himself, in the manner he mentioned. - As for the latter, he is only a witness in name, he is in fact a prosecutor in disguise. - It must, I think, be apparent to the Court, that such is the case; had it not been considered irrelevant to the case, I could very easily have proved it. The witnesses whom I have called upon, can be liable to no objection. It is unnecessary to observe that the rank of some of them, is a pledge of their impartiality; of the others, one is a Serjeant in another Regiment, and two of them are discharged Soldiers, who are consequently beyond my controul [sic]; the remainder of them are Serjeants and Soldiers of the 41st Regiment, and there could certainly be nothing to induce them, to give evidence on my behalf. - I have no influence to exercise in their favour, they must have felt the contrary, that, in appearing as witnesses for me, they exposed themselves to the enmity of Captain Chambers. - These observations will not be found groundless, when the nature of the evidence is taken into consideration. me on the left, about half an hour afterwards. - Throughout the whole of his examination and cross-examination, he is positive in establishing two circumstances of much importance as to this charge; first, the place where the sled was, in front of the ravine; secondly, the time at which he says that he saw me there. - The men, says he, had just retired before he saw me, meaning that they had retired to the ravine. Before they had retired, they had been immediately on my right, and had fallen back to the ravine. He adds, that the men were immediately ordered to go to the left along the ravine. Captain Mockler was not aware that orders had been given to retreat; he therefore went to the ravine for the purpose of collecting the men and found some of them there. All these circumstances so well recollected, so minutely and so positively stated by Captain Mockler, form a necessary part of the fact attempted to be established against me, and rest altogether upon his evidence. By the proof which I have adduced, I have not only shewn[sic] the impossibility of such a fact ever having existed under such circumstances, but I have accounted satisfactorily for my conduct from the commencement to the conclusion of the action, and I have done so, not by one witness, but by nine witnesses. who as Aid-de-Camp gave me orders to proceed to the rear for men and ammunition, and who saw me proceed to the rear in consequence of his orders. my when taking down the fence and going to the left, I went in front of the sled; had I ever been disposed to shelter myself, I then perhaps might have done so with impunity. To expose myself to danger was not then necessary, either to encourage the men or for the attainment of any object, yet I did not even then do so, I used every diligence. Nettles says, that I appeared to be in search of him, when I first met him, and even if I did not ask him about the ammunition, must I not have taken it for granted, that he had ammunition as well as Noonan, who in going to the rear says, he saw me with a sled of ammunition. I have therefore proved in the most conclusive manner, to this Court, that from the moment of my departure for the rear, after Mr. M’Lean’s orders, until the moment of my arrival on the left, I could not have been in front of the ravine; - that so far from being there, I was then in the discharge of my duty in the rear, a duty which exposed me to the very heavy fire from the enemy, while the whole of the troops were secure behind the barns on the left. no impression whatsoever in favour of my innocence? If a man’s character, when once put to the test, on a trying occasion, did not shield him from an attack upon some unguarded moment of his life, for which he could not rigourously account before a Court of Justice, no one could ever consider himself safe, without a witness at his side. Can it for a moment be imagined, that at a time when all danger had nearly ceased, I would expose a character, which, but an instant before, had been seasoned by a probation of nearly three hours in action, during which so many casualties had occurred? But, fortunately for me, I stand upon a different footing; fortunately for me, during the whole of the action, there is not a single chasm to be found in my conduct, not a single moment that is not accounted for. I am supported against the first charge, by positive and circumstantial evidence, which has completely disproved the crime whereof I have been accused; nor am I less fortunate with respect to the attack on Sandusky. angle of the Fort, and he did not see him. Serjeant Stagnell who was within a yard or two of Colonel Warburton, must have seen him also, and did not see him; their testimony is corroborated by Ensign Proctor, who fixes the moment when Captain Chambers did first arrive. But Captain Chambers has himself furnished us with evidence, that he could not have come up so soon as Colonel Warburton, “he was disabled in both legs,” and certainly those legs which to his great regret, could not perform a certain operation, mentioned by him on his examination, were still less capable of bringing him up with speed, to the right. the ravine, expecting the men to come up, he proposed to Colonel Warburton, to go back to look for them. One of my witnesses swears, that he must have heard Captain Chambers, if he had made such a proposal, but that he never did hear him say any such thing. heard this. Captain Chambers was within hearing, as well as the others; he has sworn that he knew nothing about my volunteering. Whenever the enemy perceived an object above the bank, they never failed to fire at it. The moment I became visible to them, they opened a heavy fire upon me: This Captain Chambers could not deny without contradicting what he had before saw, - he was anxious, however, to destroy any effect it might produce on the mind of the Court: Yes, says Captain Chambers, he was exposed, but took great care to shelter himself, by leaping from log to log and creeping on his belly. Two witnesses have sworn they saw no logs in the place where I passed, and that they did not see me creep on my belly. It will not escape the attention of the Court, that it was over the same ground, which I took in leaving the bank, that Captain Chambers passed in retreating, together with the others who were there; and that, although it was night at the time of their departure, it was found necessary to wait until the moon had obscured itself behind a cloud, in order that darkness might save them from such a fire, as that to which I had been exposed in broad day light. upon by me, on the part of General Proctor: We even find him lowering his loud tone of voice, to a soft whisper, least he should be even overheard by the enemy. What inconsistency does he not exhibit upon this occasion? According to his own account of himself, upon his first arrival on the right angle of the Fort, he volunteered his services to go and collect the men in the rear. - Returned from his expedition to the rear, in which he has made me so conspicuous, he remains under the bank, and while there, receives through me, receives through Mr. M’Lean, an order to bring the men to the General. But his ardour has disappeared, he is no longer the same man, doing violence to his disabled legs - he will not stir; he had just seen what happened to me; his answer was that General Proctor might come and bring away the men himself - that it was impossible to bring them through the ravine. Why impossible? Because he found himself secure under the bank, a place which he would not leave, even to obey the orders of his Commanding Officer. mony of three witnesses, it is impossible, according to every principle of evidence, that he can be entitled to the least credit as to any other part of his testimony. My conduct at the time the troops broke, my speedy arrival at the place where Colonel Warburton was, my conduct in going to the rear, to collect the men, would be alone sufficient to disprove this charge. No one will now be surprised to find, that with such an unjust and ill founded accusation, hanging over me, ever since May, 1814, I should have made such efforts to obtain a trial, and that Captain Chambers should have made such efforts to resist it. I cannot refrain from again expressing my gratitude to His Excellency Sir Gordon Drummond, for having afforded me an opportunity of establishing my innocence; that innocence I now place under your protection. 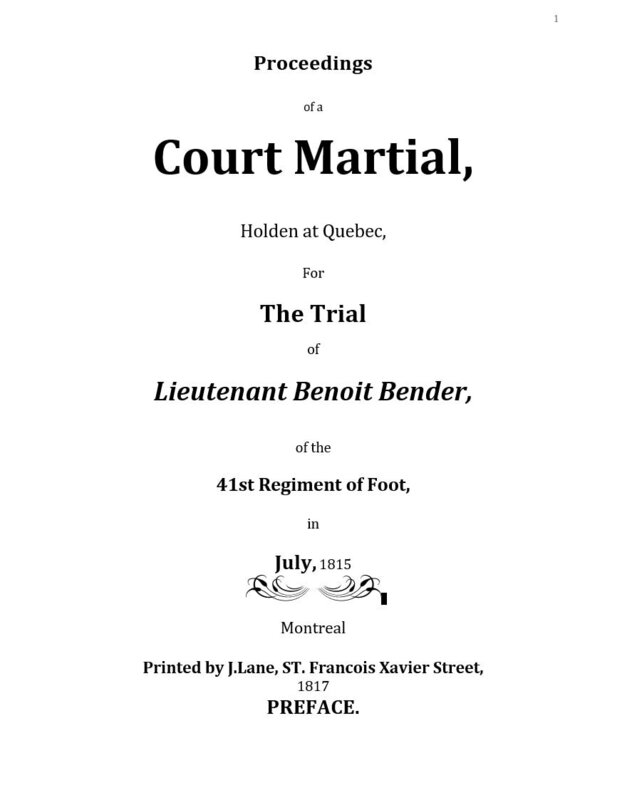 and confirm the Fnding and Sentence of the Court, and the Commander in Chief directs, that the foregoing charges preferred against Lieutenant Bender, together with the Finding and Sentence of the Court shall be entered in the General Order Book, and read at the Head of every Regiment in His Majesty’s Service. obviously, as the Memorial is dated 22 January 1815, this date should be 1814.